10mm thick boards will flex (bounce) when the underfloor suddenly dips. Once more: battens - too low and your floor will rattle! This subject seems to be a recurring "problem": battens on a concrete floor. I am laying 21mm thick solid French oak tongue and groove floor boards on a stable 21-year-old concrete floor. I've been advised to fix battens to the floor and then nail the oak floor boards to the battens through each tongue. What I am unsure about is whether I need to lay any insulation between the battens and if so, what sort? The battens are 9mm thick - just enough to secure the boards to. The planks have been in the room for about 3 weeks to acclimatise. Thank you for your question. Are the battens really only 9mm thick?? That's way to thin for this method of installing a wooden floor, the nails alone should be 50 - 60mm long for the best and long term problem free result - and on 9mm battens the nails will hit the concrete, turning your wooden floor into a rattling one. UFH and wooden flooring: it's all in the preparation! "Hi, I am having trouble in getting my floor leveled. Got the builders to remove the floor joists and lay concrete layer. I went on holiday post this and when i returned, builders suggested this was topped with insulation, and then followed by the UFH pipes. They say it was then topped by Latex screed, which by the time i came back was very unleveled and had cracks all over. To get it to level, builders use self leveling compound wherever it was needed (in large parts), but to my dismay just after 10 days, the floor has started cracking and unleveling again because of these cracks. I am so damn frustrated with all this leveling thing, and we have already got the engineered wood we want to lay on top of it. But my floor layer says, if he lays the wood on top of this floor, it will move quite a bit and be wobbly and also showed me the movement by placing a few pieces together. I have no clue as to what we should be doing now, even though builders are very nice i guess they are clueless as well. They are thinking of topping it with another layer of some kind of mixture, and I am just concerned that with 2 layers already on top of UFH, a third layer of a compound, which if everything works ok will be topped by engineered wood - which will make the UFH pretty useless or extremely expensive to heat up the floor in my view. Would you be able to advice what you think we did wrong and how can we get our floor to be leveled so the wood floor doesn't wobble and UFH remains effective too. Thank you for your question and sorry to hear about your problems. However, very glad to read that your wooden floor fitter refuses to install the wood floor on this crumbling underfloor, 'cos he's absolutely right. A floor can be unlevel, but only 3mm maximum over 1 meter and only in one direction. Presumably your fitter plans to fully bond the floor to the concrete with flexible adhesive and if the floor is too unlevel (dips and hills) this will never work: there will be air-gaps underneath the wood everywhere, rendering your UFH system useless indeed. I'm afraid you have to re-call your builders and tell them to start over with the screed - preferably back to the insulation. Your concrete/screed ontop of the UFH needs to be smooth and whole (no cracks!) in order to work and in order to provide a proper surface for your wood floor fitter. Sorry we don't have better news for you and I recommend you also get advice from the manufacturer/supplier of the UFH system. An installation of a wooden floor starts with the correct preparations, especially when there is new concrete or screed involved. Like in the case above, when you also add Underfloor Heating to the fro - a sound, dry and level concrete/screed surface is even more important. 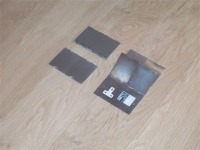 A defect surface will definitely mean a defect or at least inefficient working of the UFH. Always get advice from the supplier/manufacturer of the UFH system about the correct preparations, follow this (have this followed by you builder) and prevent aggravation, frustration and extra costs and/or delays. And never accept patching up solutions, no matter how nice or hard working your builder seems: it is bound to end in tears. If you are thinking of using Underfloor Heating and install a wooden floor, request our start-up tips here. Looking for wooden flooring but confused about all those different types around? Is your home best suited with Wood-Engineered or can you have Solid Flooring? And what finish to opt for that matches your life style? Unsure which installation method you (or your professional fitter) should use, which underlayment to buy with your floor in order to get the best result - and the least problems afterwards? Worried that any sales person is telling you 'porkies' and sells you a floor not suitable for your house circumstances, your interior design wishes or your budget? Worry no longer, just request our Wood Flooring Info Pack. Requesting the pack is simple: submit your details here, and we will dispatch in by Royal Mail as soon as possible. Opt for piece of mind - opt for our extensive Wood Flooring Info Pack. Why not to use DPM over existing floorboards. I'm planning on laying a wooden floor throughout the ground floor of my house (a 1930's terrace), on top of the existing suspended floor boards. I've read your guide and now feel much better prepared! That said, I do have one question. You state (quite clearly) that when laying a new wooden floor on top of existing floorboards, you should not use a DPM because it might cause condensation between it and the underfloor. But if I don't use a DPM then surely this moisture would just pass into the base of the new wooden floor, potentially causing problems there instead? I'm a little confused on this point! Any chance you could clear this up for me? The reason for not using a DPM when installing onto existing floorboards is that this would block the normal ventilation that should exist underneath the existing floorboards (the void which should have air gaps in the walls). Any moisture that normally evaporates harmlessly through the boards into the air will be trapped against the DPM and might cause rotting of the existing floorboards and even your joists. Using a normal foam underlayment in these cases makes sure the moisture - every home has more or less moisture during the seasons - will now still be able to evaporate through the whole construction. When your underfloor is level a 2-3mm foam is sufficient. If you need more sound-insulation it's best to use a thicker underlay (brown roll in picture, also available with DPM attached to it for concrete floors). Whatever kind of underlayment you need, don't cheapskate with the materials you use: it'll cost you in the end (inferior materials = more time correcting plus the end result of your natural real wooden floor could sound like a 'plastic' Melamine Laminated floor). It is thanks to serous DIY'ers like Richard we are able to constantly update our guides when they feel/think information is missing or we could have explain items better. Being professional installers of wooden flooring does sometimes mean we overlook the fact that some terms or methods are daily tasks for us but not for our clients. We love your input on these matters, so feel free to help us help you. 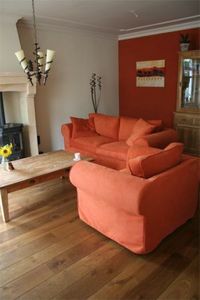 In a previous article you can read what we think about 'Cheap Offers' in Solid wood flooring and what to note. We recently received a question where the buyer ended up between a rock and a hard place. Solid short lengths on chipboard? Hi, i am looking to fit solid oak flooring in my lounge (18mm x 125mm x 300-1200mm lengths) the lounge is 6m x 4m, the floor is of chipboard, all skirtings will be removed, what is the best way of fitting this type of oak flooring.??? Thank you for your question. You're between a rock and a hard place I'm afraid. 9 times out of 10 these type of solid floors have too many short lengths in the pack - and only 1 long length. If that hadn't been the case you could have installed this floor using the floating method on foam underlayment and glueing the T&G's correctly. In this case you should fully bond the floorboards with flexible adhesive - if it wasn't for the case that modern chipboard (water resistant/repellent) don't bond with the adhesive! Secret nailing on chipboard is never a good idea (the chipboard will 'explode' due to the force and angle of the nails). Not sure if this is still possible, or if you want this: but best to return the product to the supplier and opt for a higher quality floor that can be installed floating without causing you problems and giving you a better result. Question: "Is there any way we can screed over bitumen when we want to glue a wooden floor down?" The bitumen should always be removed and not screeded over. The subfloor SHOULD be shot blasted to remove all bitumen and glue residue. I prime with a neoprime primer use acrylic leveling compound over the top ONLY if the Bitumen is well stuck down and very thin. This will give you a good flat base. You can then use a epoxy dpm paint to deal with any moister problems. Now please remember that this is NOT a recommended method by the product manufacturers. You are relying on how well the bitumen paint is stuck to the subfloor! Do not use a latex flooring smoothing compound! These compounds are good for nothing and normally used by people who have no idea. ( 95% of builders ) They will stick to anything you put them over but have very little strength, so basically you can NOT use a epoxy compound or any sort of glue over the top! I would like to put down solid oak flooring upstairs on top of the existing floor (90mm-18mm – various lengths). I am going to level the existing floor with layers of hardwood plywood and I am thinking of putting 6mm fiberboard underlay for acoustic reasons. I am considering a floating installation, however, a number of websites state that NO solid wood flooring can be floated. be as long lasting as the nail down or glue down floor. have some important advantages and disadvantages to the other fitting options. The opinions on floating solid wood floors vary indeed. We - and our manufacturers - have no problem with floating solid wood floors, as long as certain rules are followed. One of them is - unfortunately for you in this case - the width of the boards: narrower than 110mm means glueing them down. You can use the same preparations you're planning now, use a suitable parquet adhesive and fully bond the floor to the subfloor you've made. Q: Thank you very much for your help. I am inclined to go with your excellent suggestion. I would like to have a stable floor but I am also concerned with the footsteps sound (especially upstairs). install sliding door wardrobe on it. The Sika Silent Mat is one solution indeed. Another one would be the Elastilon 'self-adhesive' sound-insulation underlayment. The Elastilon comes without DPM and is therefore very suitable to use on existing floorboards or 'subfloors' of sheet material like plywood or chipboard. We suggest you use the Elastilon 'Strong' which is the most suitable for narrow strips. Q: Your site is of great help. We're planning to lay oak flooring onto a new concrete floor which has dpm and insulation. If your boards have T&G, are 100mm wide or wider and your concrete floor is level there's no need to install plywood for installation purpose. You can install the new floor floating, using a Combi-underlayment that contains a DPM layer, glueing all T&G's and leave an expansion gap around the perimeter of the room. That's all you need in fact. I want to face fix and glue onto 12mm ply. what is the best glue to use? I will be laying the air bubble and foil insulation which is 4mm thick under the ply. do i need to lay acoustic underlay on top of the ply? I hope to use 180mm sawn oak boards - planks basically with no t&g. do i need to do anything special with this type of wood ? what is the difference between this wood and t&g. is the t&g option better ? Make sure the Oak boards are dried to floor standard (moist content in the wood between 9 - 11%) and can acclimatise in the room you plan to have them installed in. Difference between your boards and T&G boards: T&G's can be installed floating, secretly nailed or fully glued down, boards without T&G should be glued and pinned down (as you plan to do). Q: My ground floor is covered in herring bone parquet which I believe to be paranna pine laid about 60 years ago. In some places gaps have appeared between the blocks. I've been told that the usual filler is sawdust (from sanding the floor, which I've done) mixed with some adhesive. Is this correct and if so what's the best type of adhesive to use? The best product to use for filling gaps in parquet floors is special wood-filler like Lecol7500 Blanchon Resin Filler, not white pavc wood glue. Mix it with the sand dust from the original floor to reduce colour differences as much as possible. 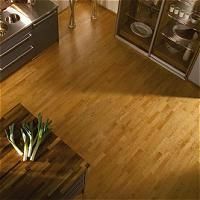 Natural HardWaxOil will, like any natural finish, darken the floor a little bit. How much you can test by wetting a little piece of bare - sanded - wood, this will 9 times out of 10 the end colour after applying a natural, clear finish. Q: I'm fixing to install a bamboo tounge & grove wooden floor over a plywood sub floor. I was going to nail it using a finishing nail gun or should I use another type of nailing system? What about drilling & then nailing? I was hoping not to have to nail every board but from reading this forum every board has to have at least 2 nails. Can the tongue & groove be glued & lay as a floating floor? Or can the tongue & groove be glued and nail every 12"? Depends on how wide your bamboo boards are, normally around 90mm? That is to narrow to install floating, but glueing them down with parquet adhesive would be another (better?) option. In our experience Bamboo has very tiny T&G and might splinter/break very easily when nailing them and yes, every board has to be nailed every 30 - 35 cm. A: Thanks for the advise. The planks are 3 3/4" wide and I was going to do a floating floor because I felt that this was the easiest way and I'm doing it myself with my daughter but if you say I can't i will glue it. I'm after some advice on the best way to install a solid oak floor. I am fitting 120mm wide T&G oak on top of a slightly uneven plywood floor in a living room (6m x 4m) on a first floor above a bedroom and want to reduce the sound transmission to the floor below as much as I can. After looking at other posts I was considering using fibre boards to level the existing floor and then fitting the oak flooring using the floating technique and gluing the T&G. Would this solution work ok or can you recommend a better solution? Fibre boards should be ok to use, or you can use Timbermate Duratex (no DPM) 5mm for extra sound insulation. In our experience it reduces the sound of footfall better than the fibre boards. Q: I am planing to install a solid wood floor on concrete. Ive had to remove some old tiles which have left the concrete black but dry. I was sold Gutoid Parkett S11 adhesive and Stopgap F76 waterproof membrane with the wood. However, I haven't read anywhere that its necessary to put membrane down if I'm glueing, do I need to? (id rather not if poss). If I do then can I put the glue directly onto the membrane? I'm also a bit concerned as I bought all this stuff 2 years ago and have just noticed that the glue and membrane has a shelf life of 12 months. Any advice would be much appreciated as im really confused now. Dates on products are there for a good reason: their quality deteriorates rather quickly once they pass their 'use-by' date. Bin it - ecofriendly!, is all I can say. What is the width of your new floor boards? If wider than 100mm then the easiest and simplest option is to buy combi-underlayment, PVAC wood-glue and to install your wood floor using the floating method. I thought I should probably bin it. The boards are 12cm wide, but there are a lot of short boards, maybe 25% under 50cm long (but only just, and I didn't have any problem avoiding a pattern when I laid upstairs). Another concern is that the concrete floor is not completely level and bulges in places. What do you recommend to sort this out? One of our contacts wrote an article on preparations of the underfloor on this FAQ & News site, see here. Especially bulges are tricky when not leveled, specially with many short lengths. The floor will see-saw all over the place. So best thing to do is making sure the concrete floor is made level. Q: Lifted old parquet flooring. How can I remove bitumen before laying? Any residue of bitumen will effect the bonding time of any modern adhesive type (like Lecol5500 or B92 Stycobond): instead of 4 - 5 hours it can take up to 24 hours before it holds properly and you can sand over it. We've just built a new house and have had the heating on for the past number of weeks. We tested the moisture level of the concrete the flooring will go on at it's currently 4%. The wood for the floor has been in the house for the past 2 weeks. Would we be ok to go ahead and lay the flooring now? You have to wait a bit longer we're afraid. The moist level in the concrete should be 2% or less before you can install the wood floor. Rule of thumb: every inch (2.5 cm) of concrete/screed takes approximately 30 days to dry. Q: In that I am totally inexperienced at this, I humbly engage your patience. If your existing floorboards are level (un-cupped and sound) you can install your new floor on top of it without any problems. We recommend you use a foam underlayment for sound-insulation, leave expansion gaps all around of min. 10mm. I'm planning to install 20mm solid oak T&G into my kitchen. The room is 8m x 3m total size, but half is well ventilated suspended (400mm joist spacing), and the other half is concrete (30yrs old, dry). I want to lay the boards parallel to the shorter wall, to try to give the impression of a wider room. Lay directly onto whats there; I would have to noggin all the joists first because they run in the 'wrong' direction. I was going to secret nail to the joists but then when I get to the concrete I suppose I'll have to glue? I realise I'll have to live with a compromise somewhere though, I just wondered what you would do if it was your place? 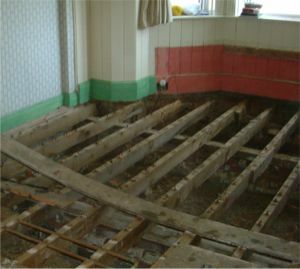 We would make sure there is one type of underfloor, using sheets of hardboard (glued to concrete, nailed to floorboards). This will also solve your problem of installing the new boards in the same direction of the old boards. Then, depending on your preferences you could either glue the new floor to the hardboard or install floating using a foam underlayment. Q: Hi, I want to lay 23 m2 of solid oak T&G flooring, the existing floor is a concrete one, with hard vinyl tiles layed down on bitumen. what would you recommend? If I take up the vinyl tiles I know it will be a real pain getting up the bitumen, but if i lay the oak floor floating, will I have problems with it coming apart? If the vinyl tiles are stuck down well, the underfloor fairly level and your solid Oak boards are wider than 110mm then we would install a floor in this circumstances floating on a combi-underlayment, glueing all T&G's correctly. Q: Hi, thanks for the quick response. Unfortunately the floor is a solid oak,18mm thick, by 83mm wide random plank length, so I assume laying it floating is a no-no. would it be possible to glue it to the existing vinyl tiles, provided they were stuck down well? We're afraid not. The structure of the tiles will not allow the adhesive to bond correctly. alternatively you could screw plywood ontop of it first and then glue the wood floor on to that. Q: Hi Karin, thank you again. Ive decided to fetch up the existing vinyl tiles. I'm either going to use elastilon strong over a DPM, or use a primer and a liquid batten such as sikabond T2. Which method would you recommend? And do I have to remove all the bitumen residue from the concrete before using a primer? The more bitumen you remove the better it is. Using Elastion also has the advantage of tackling minor unevennesses in the underfloor, but for the rest it is personal preference what to use. FAQ: Can I install wood over carpet? We are thinking of laying a wood laminate floor in our rented house. At the moment it is carpeted, with underlay, on top of concrete. The carpet is quite thin. If we give the carpet a good shampoo, is it ok to put the floor on top of the carpet, to all intents using this as an underlay for the floor. Using a carpet underlay or a carpet as underlayment for wooden flooring is asking for trouble I'm afraid. Cleaning a carpet will never get rid of all the dust, dirt (and bugs) it has gathered over its lifetime. Best is to remove it, including the carpet underlayment and start 'a fresh'. Solid Offers: beware of the "short end of the stick"
Wood flooring is a very popular floor covering - besides being easy to clean and anti-allergic, it enhances your home and can even increase the value of it. But.... being popular has its own down-sides: many are jumping on the 'band-wagon' of its success to make a profit. Nothing wrong with this when quality products are offered for what they are worth, we all know and understand the logic of 'value for money'. 'Value for money' not only means supplying decent products but also supplying decent information, correct and honest. And that is sometimes the biggest problem with 'Solid Offers' - too little information on what the 'offer' really contains. This pictures was kindly supplied to us by one of DIYnot.com forum members. Besides problems with the pre-oiled finish and installation errors by the fitter (not the forum-member) the floor has many very short lengths and hardly any longer lengths. Products like these (most with a proper finish) are sold as Solid Oak floorboards - Oak strip flooring - in random lengths between 300 - 1200mm. The correct and honest information missing in the shop and on the packaging is the amount of short lengths a pack contains. Sometimes as much as 50% of the contents of a pack is shorter than 500mm and only 1 or 2 boards - if your lucky - are the full 1200mm long. Since it is recommended to prevent a pattern of joins and to space the joins of connecting rows at least 300mm apart with this amount of short lengths it is very hard to do - creating not only an unstable, prone to movement, floor - see picture on the right - but also giving your solid Oak real wood floor a very hectic appearance, specially if all 4 sides are bevelled. This pronounces the many joins in the floor even more. Value for money: if the information on the packs leaves you in doubt ask the supplier for specifications - he/she ought to know what he/she is selling you in the first place! Don't end up with the 'short end of the stick' or in these cases 'short end of the boards'! Underlayment is one of those items where we receive many questions on (and that's no wonder, there are so many different products around - all with their own benefits, instructions and promotion slogans). Sorry in advance if this is going over old ground. 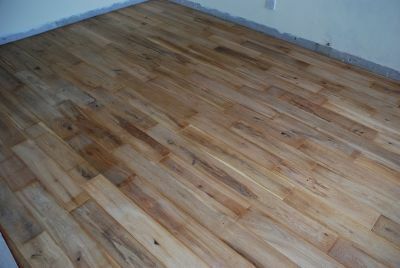 Have recently bought bamboo flooring and will use the "floating method" to install, the underfloor is all old concrete. Could you give me some guidance on underlay etc. Is it better to use foam and hardboard or the all in one "feltboard type"? Also what kind of expansion gap should I leave as the suppliers told me it is minimal 5/6mm as bamboo is virtually shrinkproof. Thanks very much for any advice you can give me. If your concrete floor is level (may have a gentle sloop of 1 - 2 mm per meter, but no sudden drops or 'hills') it's bes to use a combi-underlayment. We always recommend to leave 10mm gaps all around, no natural wooden flooring is 'shrink' or 'expansion' proof. Thanks for the guidance,(the underlay I mean comes in blocks/slabs and you just cut to fit.The floor is not too bad a little slope running down the hall about 3/4mm over about 2 metres. I do have to be careful with not gluing the boards to the underlay don't I. Also do I need to use cork expansion strips? You're right about having to be careful when glueing the T&G's, any spills on the underlayment can 'strop' the floor when it 'moves' during the seasons. Cork expansion strips just fill up your expansion gaps! You don't need them. Thanks very much for the advice, it's very much appreciated. During renovations or redecorations a lot of work has to be done; like cabling, plumbing, screeding, plastering, wall-papering, painting etc. When you also plan to have a new wooden floor installed it is very important to schedule this job at the end of the 'line'. Basically you first have to do all the 'wet-work' in and around the room(s) you plan to have wooden flooring in, plus allow sufficient time for the excess moist of plastering and/or painting to evaporate. We advised BBC's DIY-SOS team the same when we were asked if it would be possible for us to install one of our quality wooden floors (on short notice). The short notice wasn't the problem, the fact we would have just one day to install it neither. The fact that there was going to be a lot of plastering and painting in the days before was the problem. You really shouldn't install a wooden floor (wood-engineered included) straight after the last day of plastering or painting. Since DIY-SOS is always working on a very tight time-schedule we advised the team to source another type of floor-covering. Of course, in the future we are more than happy to help them out - as long as their project doesn't involve massive plaster work beforehand. In renovation projects like this it comes in handy when you have a hygrometer in the room(s) you're working in as a guide to when the moist of plastering and painting is gone. You can speed up this process with sufficient ventilation, where the excess moist in the air is drawn out of the room - even in winter, just open the windows for 5 - 10 minutes every hour. For screed work (or new concrete) there is a practical 'rule of thumb': every inch (2.5 cm) of screed/concrete needs 30 days to dry-out naturally before any floor-covering (but especially wooden floors) can be installed without causing problems of expansion or cupping straight away. The moist in the screed/concrete should be around 2% - 2.5% tops before you can start the installation of a wooden floor. When you install a wooden floor on a still too wet underfloor you will notice this pretty soon. The wood will absorb the moist of the screed/concrete (even when a combi-underlayment is installed) and expand very quickly. So be patient and prepare your 'when-to-do-what-task' list carefully but practically. In our April newsletter we explained our sample policy: Samples, why not. Because of the rich characteristics in natural wood we know that a tiny sample of any wood-type will never show you nature's variety in full. A very wide variety in colours, from very dark (like the tiny sample) to lighter and very light. Some boards have many knots, some none at all, some boards might even have medullary rays ('flecks' or 'mirrors'). At Wood You Like we feel strongly that the best way to select the natural wooden floor most suited for your unique interior design is by looking at very large samples in our showroom or for us to present you with high resolution Interior Design Pictures to show off the rich characteristics of natural wooden flooring. And that's what we have launched just now: a first batch of 58 high resolution Interior Design Pictures from our Duoplank and Solid Flooring range downloadable from our website. More ranges will follow very soon. Wood is a wonderful product of nature, very versatile in species. But nature also 'dictates' very versatile characteristics in every species, making everything individual (like human beings, we're all different in shape, looks, colour and character). Wood is no different, every individual board has its own colour, look, character. One piece of Oak Rustic can have many knots, sapwood areas and even some medullary rays. Another piece of Oak Rustic (even cut from the same tree) can have a completely different appearance: tiny knots perhaps, slightly darker in colour than its 'neighbouring' board and no medullary rays at all. That's what makes a wooden floor so natural, but also makes it hard to choose a floor from a tiny sample send out to you. It can never show you all its natural variety. That's why Wood You Like has large sample boards in the showroom, containing at least three different pieces (single boards) in the sample to give you the correct best impression of how that type of flooring, that type of wood in that type of grade and colour can look like. That's why Wood You Like websites and online showroom shows interior design pictures, not pictures of a piece of wood. We want to 'show-off' the richness of nature's varied character. That's why Wood You Like doesn't easily send out tiny samples, it will never give you the best impression. You might receive a dark piece, not matching your style or colour idea at all, while in the total floor it would 'blend' in seamlessly between all other varied in character boards. There is another reason for not sending samples: all wood-types 'mature' once exposed to light (and not just sun light). Some wood types start pale and get darker or honey-coloured (like Oak), some start light brown and turn brown-reddish over time (specially tropical wood types) and some turn from vaguely dark to deep dark (Jatabo amongst others). A 'fresh' sample send out for a colour match with your design will not show you the ultimate matured appearance of your natural wooden floor. Nature is too varied to have your choice in wood dictated by a small - tiny sample. Come and see it in situ in our showroom or download our Interior Design Pictures of many wood-types in our various ranges. I've read your guidance on installing over 2 types of subfloor. In our case most of the floor is newly laid concrete with two areas of wood floorboards. You suggest a dpm over the concrete and then hardboard over the whole area. What thickness of board & what type (?ply) do you recommend? How should it be fixed? We're concerned about the overall thickness of the floorcovering, it is the hall with five doorways off, with four different floorcoverings on the other side. All depends on if you plan to install the wooden floor ongoing (i.e. without thresholds in between the rooms). Is so, thin sheets of hardboard (3mm) would be sufficient. 10 or even 5 years ago most homes had a television set, a VCR and a hi-fi system. DVD-players have replaced the old video tapes, plasma screens the old 25 inch TV set. Home-cinema's are on the increase, really enjoying the Dolby-surround effect adds various speakers to the audio and visual system. But where do you hide all these? We are frequently asked to 'hide' large amounts of cables in the expansion gaps (gap around the perimeter of the floor to allow the wooden floor to expand/shrink over the different seasons: 'wood works'). Not only would this render the necessary gap useless, cramping different cables in this narrow space could also effect the quality of sound and picture negatively. But we have found a solutions for this. To be honest we can't solve the wiring ourselves, but we would like to introduce you to a company that can solve this for you: CableGuys Ltd, based in Folkestone. 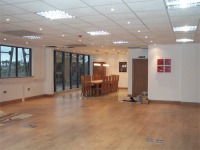 They specialise in Home Audio Visual and Corporate Cabling Solutions. Cables of home theatres, hi-fi systems and cinema's neatly hidden away. When you search the Internet (or your local paper for that matter) you can easily find many cheap offers in solid Oak wood flooring. Explained in another post using the correct underlayment (with floating installation method) has to be the start of your enjoyment of the end result. Know what type of Wooden Flooring is offered. As a member of two Online DIY forums we frequently give free advice to any "would be" wooden flooring installer. We do notice there is a lot of confusion about names of products and before we continue with other wooden flooring items we would like to introduce a more righteous terminology in types of floor covering. 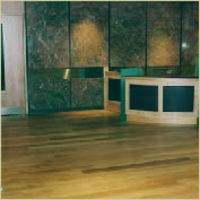 The most confusion is about laminated flooring, used by DIY-ers (and even some suppliers) for both Melamine Laminated Flooring (the ‘plastic’ – Melamine’ stuff with only a photo-copy of wood) and for Wood-Engineered and Wood-Veneered flooring (flooring with a solid wood top layer between 0.2mm and 6 – 8mm with a crossed-backing of pine/plywood or mdf). In the (English) wood-flooring profession laminate is used to describe the Melamine flooring (like Pergo, Quick-step etc). The term Wood-Veneer is officially only used when the solid wooden top layer has a thickness between 0.2 to 1.5mm but frequently Internet searchers mean all the different types of Wood-Engineered flooring when using this term. The top layer of this kind of product isn’t sawn, but peeled from the trunk and then glued (under high pressure) to a backing of mostly HDF. Although a very thin layer it is (normally) not of inferior quality. A veneer board can't be sanded though. Wood-Engineered covers the rest of the ‘engineered’ flooring where the solid wooden top layer is more than 1.5mm thick (and can go up to even 8mm), but has a crossed-backing of a different material than the top layer. Solid wooden flooring with cross backing of the same wood (to make it more stable) is called ‘composed’ wooden flooring. Real wood is sometimes used to describe Wood-Engineered and Wood-Veneer flooring as opposed to the Melamine Laminated flooring. Solid wood T&G boards: these are made out of the same material (Oak, Maple etc) with Tongue and Groove on all four sides (although some manufacturers/saw-mills still create them only on the two long sides). Parquet or overlay: unfinished Solid planks/strips/tiles/blocks without T&G, which are either glued and nailed on a solid mosaic (5-7 ‘fingers’-tiles) or plywood/chipboard subfloor or glued directly on a concrete/screed underfloor (like mosaic tiles, herringbone or other patterns). The planks/strips/tiles/blocks are 6 to 10mm thick and are known in The Netherlands and Belgium as Overlay floors. Miss-use of Parquet term. Where in the mainland of Europe Parquet (Parket) means wooden flooring (any wooden flooring, from solid, wood-engineered to wood block design patterns like herringbone) in the UK the term Parquet is commonly used to describe the latter: wood blocks in any design pattern. We have noticed however that some manufacturers and retailers use the term Parquet in the UK to promote the 3-strip Wood-Engineered (or 3-strip Wood-Veneer) flooring, which does lead to disappointed customers expecting a real (solid) ‘old-fashioned’ parquet floor instead of the T&G (or click) boards they are in fact purchasing. Buying a home is a milestone for most of us; be it finally getting onto the property ladder, up-grading or down-grading. For the next 25 - 30 years East Kent is a designated growth-area and over 30.000 new homes will be build in and around Ashford alone. Nowadays most new builds come with a choice in floorcovering, from 'standard' wall-to-wall carpet to (mostly) Wood-Veneer or if you're lucky even proper Wood-Engineered flooring. Only, most larger developers restrict the actual choice you have: they send you to one flooring supplier where you can decide between Oak, Beech or perhaps Maple 3-strip. If you want something else or a better/higher quality you have to prepare yourself for a 'hard struggle'. Our own experience has taught us that 'stubborn' new home buyers usual get what they want in the end: i.e. the Natural Wooden Flooring from the company they select themselves and where the difference in price between the 'standard' fixed choice and the final choice isn't (on average) that much. If the developer/builder agrees to it, the alternative choice can be included (and paid for) before the exchange date, resulting in the new home owner not having to pay the VAT on the wooden flooring nor on the installation costs. A word of advice: when buying a new build home on a large housing estate it's better to wait with installing Natural Wooden Flooring until all building works (including the final road surface) is completely finished. Imagine the 'sanding-effect' on your newly installed floor! In these situations we advice a cheap (and cheerful) carpet, not too light in colour, until all 'dust has settled'. Or, if you insist, on a wooden flooring with an oil finish (instead of a lacquer finish).